The official event poster for the first all-heavyweight pay-per-view broadcast has been released. “UFC 146: Dos Santos vs. Overeem” takes place May 26th inside MGM Grand Garden Arena in Las Vegas, Nevada. The billboard isn’t the most aesthetically appealing ad the organization has ever issued, but it gets the job done, nonetheless. 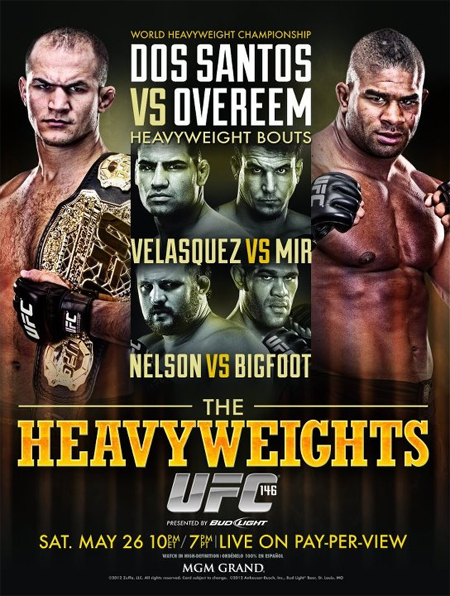 The show’s featured attraction pits freshly-minted champion Junior dos Santos against Alistair Overeem. A top contender shootout with Cain Velasquez and Frank Mir serves as the night’s co-main event. Roy Nelson vs. Antonio “Bigfoot” Silva, Shane Del Rosario vs. Gabriel Gonzaga and Stephan Struve vs. Mark Hunt round out the main card.